Here I am driving all the way to Richmond for food. What am I? A masochist? 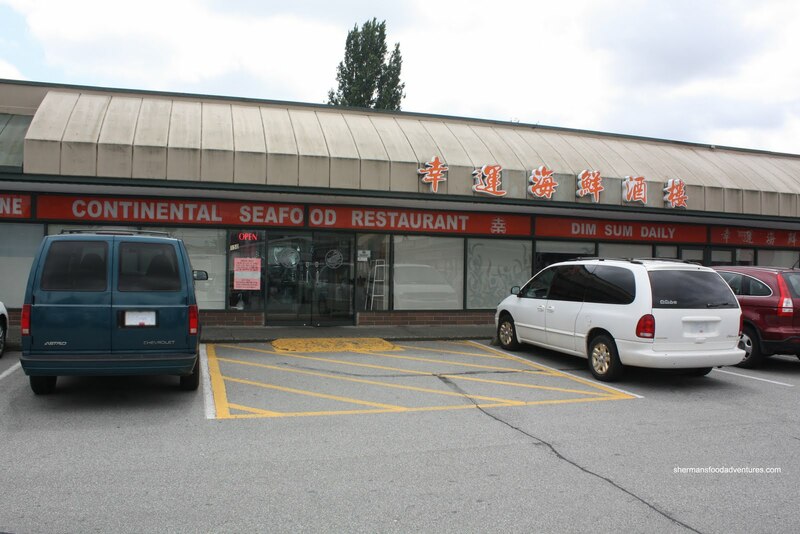 No, I just like food and will begrudgingly admit that there is no way one can avoid Richmond if you want to cover all the bases when it comes to food in the GVRD. There were many roadblocks, figuratively and literally, hindering my journey to the land of no shoulder-checking. There was a huge lineup on the approach to the Queensborough from New West, so I took a detour and headed down Marine Way. Worse. Construction limited the traffic to one-lane and ultimately, it took me an hour to get to my destination. For all that Richmond has to offer, we se ttled on Continental. This place has been here forever in one shape or form. One of the main reasons I chose this place is that they still have Dim Sum push carts. This form of Dim Sum service is dying a slow death and in some ways I don't miss it. However, to kick it ol' skool, we did the push cart thing in a restaurant that carried a lot of memories from my childhood. Now, if you know me by now, you know I am very irritable when it comes to parking in Richmond strip malls. There never seems to be enough parking for the amount of businesses that operate in the plazas. And the one here is no exception. At first glance, it appeared to be a really large parking lot. A closer inspection revealed a tonne of time-limited spots that do no good when you want to sit down and eat a meal. So there I was, circling over and over again looking for that precious parking spot. I had to keep myself alert because lurking in the weeds was the ever-so-prevalent spot-stealers. You know the type - they have already driven past the exiting car by a good 10 feet and still signal while reversing to block you out of the spot. I was ready. I would not le t myself be the victim. I spied a spot, clenched my teeth, hung onto the steering wheel tight and slipped in quick before I lost it. Success! And to boot, we got a window seat too! I love Richmond! As we settled in, the first thing to pass by was the Soya-Fried Rice Noodle Rolls. Perfect, the kiddies love this. Although it was a little haphazardly plated, the noodles were not bad. Just the right amount of soy and not too greasy, this was pretty much textbook. The texture was good too being soft while still retaining some elasticity. 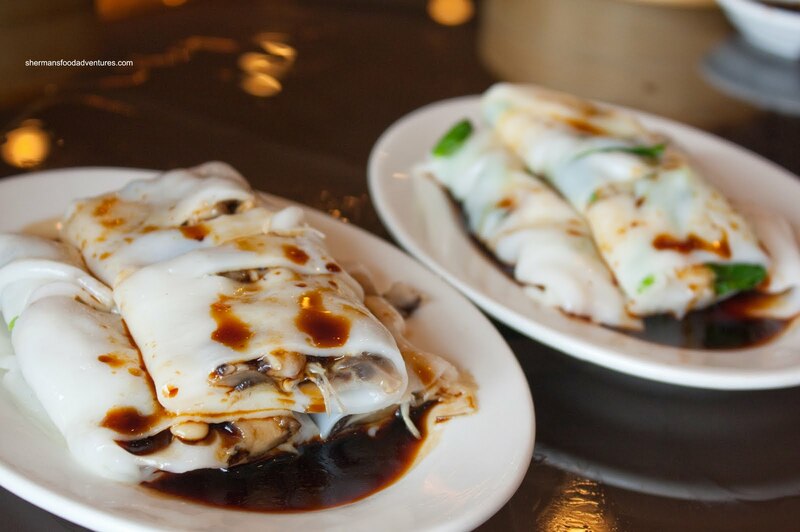 We also got an order each of the Mushroom Rice Noodle Roll and Scallop Rice Noodle Roll. Yah, no beef nor shrimp this time. Even though I'm not exactly a vegetarian, the mushroom roll was very good. With a nice combination of shiitake, enoki and straw mushrooms, there was both texture and plenty of Earthiness hitting the palate here. It reminded me somewhat of the mushroom dumpling at The Jade, except in rice noodle form. I was only marginally okay with the scallop roll. There wasn't too much scallop and if there was a piece, it was overcooked. The texture of the rice noodle itself was a little different than that of the soya-fried noodles, it was somewhat gummier. 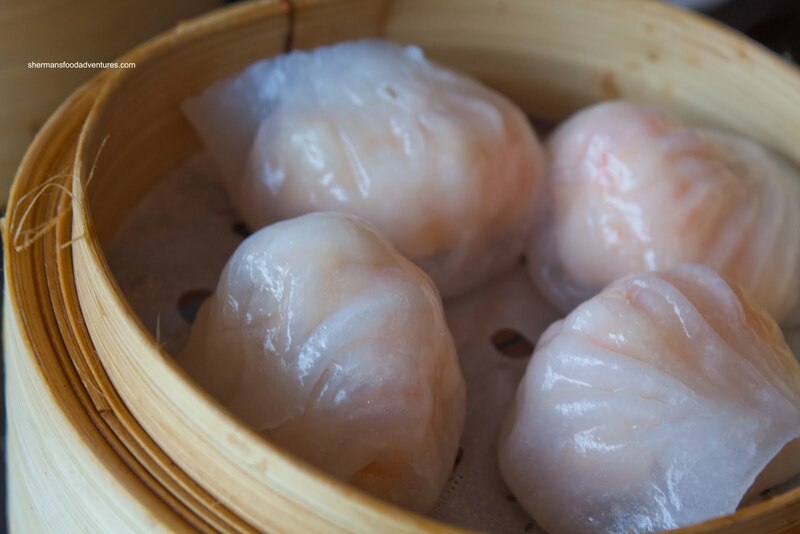 Of course we had to get the Haw Gow (Shrimp Dumplings) and we were fortunate to get our hands on some because with push carts, they are usually snapped up quick. These were pretty good with well-balanced textured dumpling skin that exhibited a bit of chewiness while still being very easy to eat. The shrimp was crunchy and in large pieces with little filler. The one issue we had with it was the liberal use of salt/MSG. The darn thing was salty and it killed the sweetness of the shrimp. 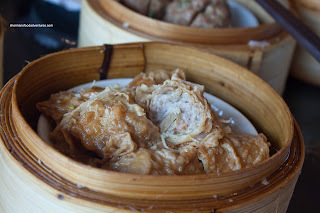 As for the Sui Mai (Shrimp & Pork Dumpling), it was the opposite being mostly sweet. They were big though and had a good mix of shrimp, pork and shiitake mushrooms. The texture of the pork and shrimp were good having a nice snap. I only wished they would have let up on the use of pork fat. There was a tad too much. Now pork fat was not an issue with the Bean Curd Skin Rolls. There was a balanced mix of ground pork and veggies which were well-seasoned within the perfectly textured fried bean curd skin. 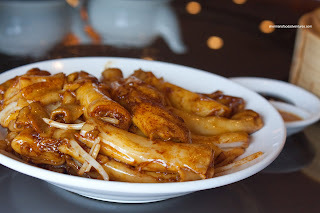 I particularly liked the addition of compoy in the oyster-based sauce, it added a unique flavour to the dish. Another minor issue was that the rolls could of stood for more filling. They looked pretty flat and loose. Another well-seasoned item was the Beef Meatballs. 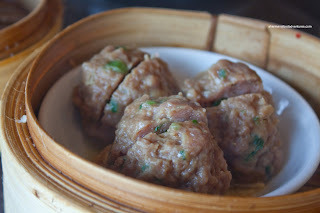 They were not very large compared to other meatballs I've had at Dim Sum lately; but texture and taste made up for the lack of size. The meat had the right "bounce" with just enough green onion. 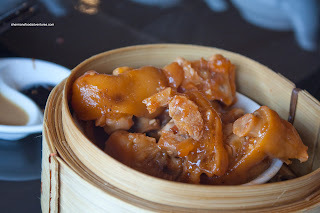 Again, I had to order one of my go-to dishes which was the Blackbean Pork Spareribs. Although there was plenty of taste, it was predominantly salty. I didn't get much garlic flavour despite seeing it. There was a slight hint of dried orange peel through all of the salt and MSG. The texture of the ribs were fine where it was marinated enough to be tender while still retaining some chewiness. However, most of the pieces were either fatty or cartilage. This could be due to the luck of the draw more than anything else. 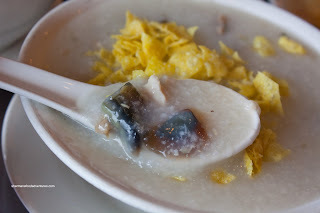 My daughter loves congee so we decided to try their Preserved Egg & Salted Pork Congee. 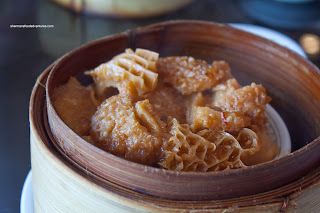 We didn't hold out much hope because Dim Sum congee can usually be pretty nasty without much ingredients. We were pleasantly surprised to find out not only was there a plethora of ingredients, the congee base was pretty good, albeit with MSG once again. Of course my son had to have the Shrimp Spring Rolls or I really mean the fried wheat wrapper. Well, good for him this time since the wrapper was really thick. Did they double wrap these? I mean, they were crunchy and all with lots of crunchy shrimp inside. Yet, as you can clearly see in the picture, the wheat wrapper was far too dense causing the inside to become a bit wet. 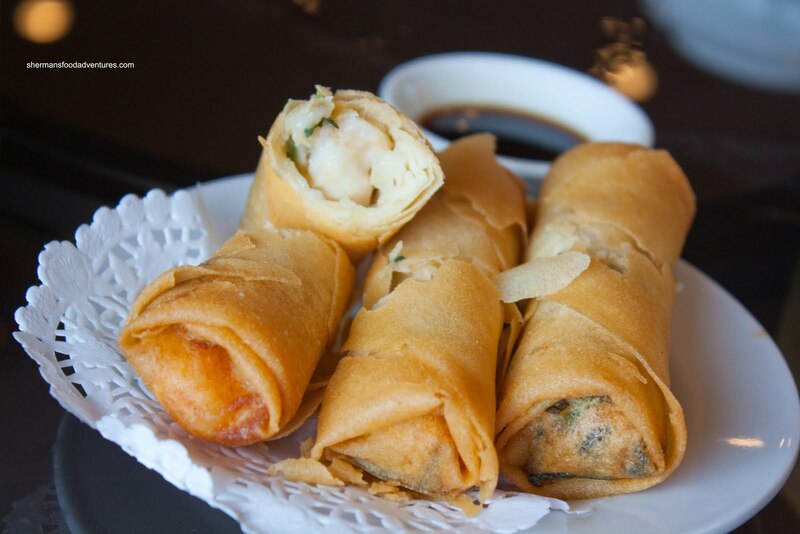 Other than that, the spring rolls were fine. Much like the haw gow, the Shrimp & Pea Shoot Dumplings were pretty good. Usually, one might find only 3 of these in a steamer at other restaurants; but there were 4 large ones here. 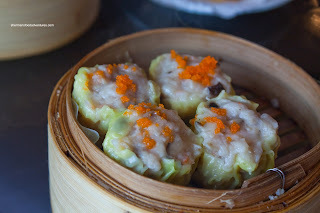 They were filled with crunchy shrimp (which were curiously not as salty as the haw gow) mixed with good quality pea shoots. 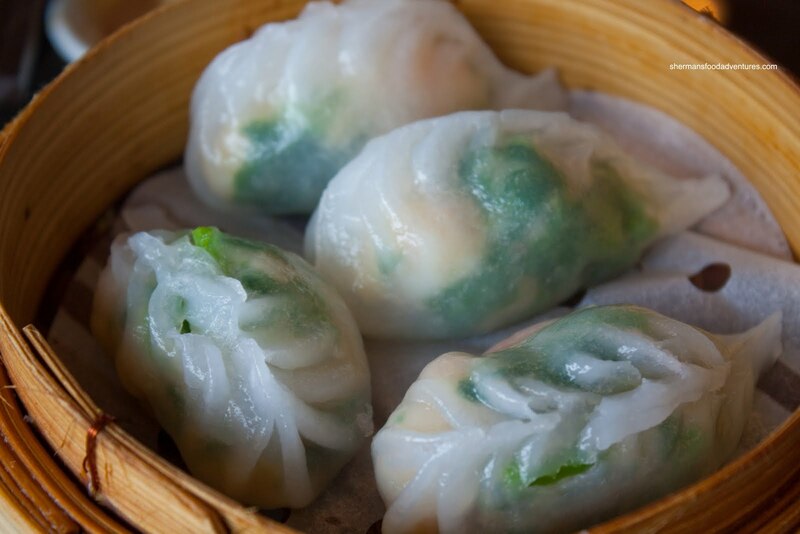 The dumpling wrapper was slightly thick in parts; yet that did not really affect the dumpling too much. Now for the offal course of the Dim Sum meal, which was the Steamed Tripe. I really liked the way they prepared it here. Each piece was a good size and the overall portion was large. The tripe did not have a gamy taste and was well-seasoned (probably too seasoned). Lots of garlic flavour with a touch of chili flakes for spice. It was very easy to chew while not being too soft at the same time. Very good. 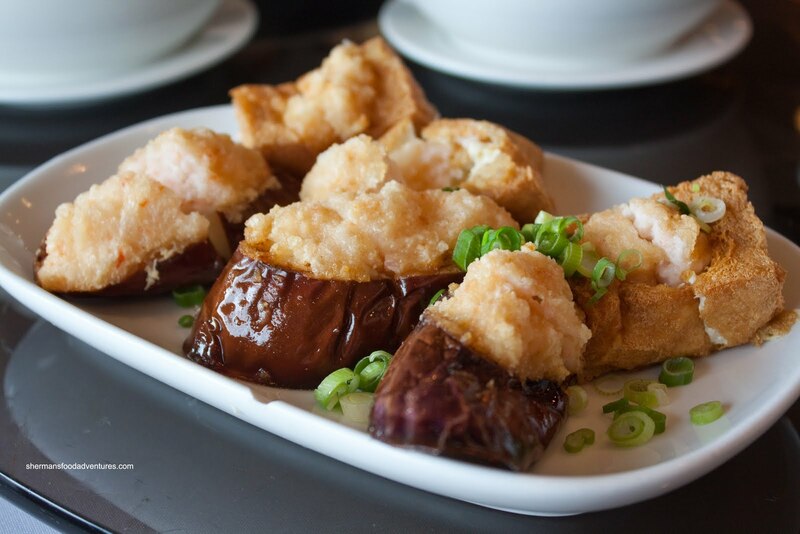 Normally, we find the Shrimp Mousse Stuffed Eggplant and Tofu as separate dishes; but it came on one large plate here. If we had known about the price, we might've thought twice about ordering it. Ignoring the cost, the tofu and eggplant were fried perfectly. Both were soft while still maintaining their structural integrity. Both had a crispy exterior; yet not being mushy inside. One thing we would have liked to see was more shrimp mousse, especially in the tofu. We got the black bean sauce on the side and it was a good thing too since we could control the saltiness of the dish (because the sauce was salty). 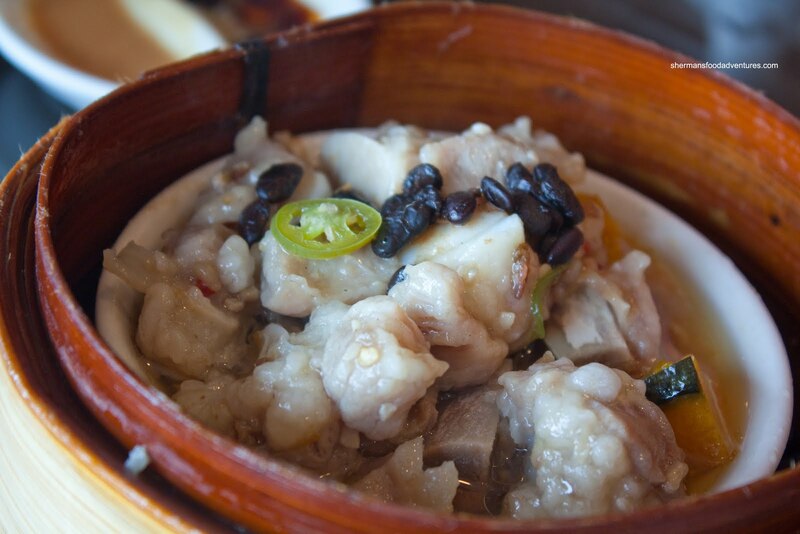 A dish not normally seen during Dim Sum is Pork Hock, unless it is the stewed version in vinegar and ginger. That is why I had to get it when I saw it. Unfortunately, the pork hock was not cooked long enough prior to steaming. It was very hard and most of the tendons underneath the skin were very difficult to chew and detach from the bone. Hence, the flavour penetration was lacking as well. Lots of flavour in the layer of skin; but not so much underneath. 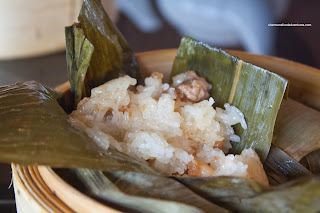 The sticky rice or Jun Gew Lo Mei Gai was already sitting at the table before I got in the door. I had originally shared one with Viv at the start of the meal and it stayed untouched for the rest. The reason? It was meh. I found the rice too wet and the pork filling to be bland. Not a very interesting nor appealing item. We didn't go for seconds. Lastly, we had to get the standard Mini-Egg Tarts for the kiddies. We were able to wrestle one from them and I split it with Viv. These were good. The tart shell was flaky and light while the egg custard was smooth and not too sweet. No wonder we almost didn't get to try them. By the end, we were pretty stuffed. We had ordered quite a bit of food. However, that didn't prepare us for the final bill of close to $100.00 before tip. Realistically, the food was pretty decent, albeit with small issues with almost everything. But due to the higher-than-we-expected pricing for this type of restaurant, the decent food suddenly became average. The push carts were a treat and so was the surprisingly attentive and friendly service.